Greatnet.de Review 2019: Is Greatnet.de a Good Hosting? German company Greatnet.de was founded in 1999. This hosting provider owns its own German data center and provides a small selection of hosting services. German company Greatnet.de was founded in 1999. They own their own German data center, and they provide a small selection of hosting services. Their website is available in German. Greatnet.de’s own data center is located in Frankfurt am Main. It has multiple redundant gigabit lines, four uninterruptible power supplies, diesel generators, and 24/7 security and monitoring. Housed servers use solid-state drives for disk read/write speeds of up to ten times faster than traditional hard disk drives. 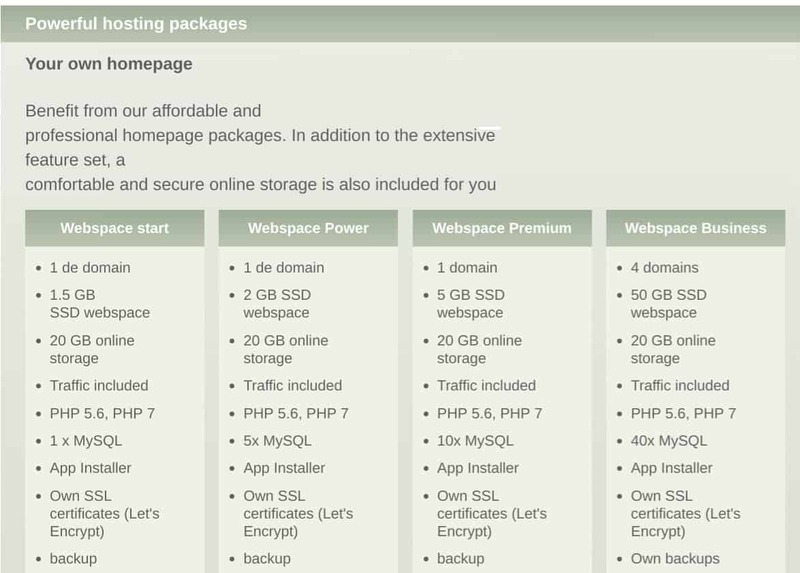 Greatnet.de offers four shared hosting plans, called Start (1.5GB disk space), Power (2GB disk space), Premium (5GB disk space), and Business (50GB disk space). All plans come with unlimited traffic, backups, MySQL databases, and support for PHP versions 5.6 and 7. For beginners, they also include a website building tool and a one-click app installer. As well as shared hosting, Greatnet.de also offers three VPS plans – with 1 GB to 6GB RAM and 60GB to 240GB web space – for when you are ready to scale your online presence. Greatnet.de’s prices are okay for the resources you get but are certainly not the cheapest I’ve seen. It’s great that this company owns its own data center, and that they support PHP plus beginner-friendly features such as a website builder and one-click installer. All prices include VAT, a Let’s Encrypt SSL certificate, and a free domain, so there are no nasty surprises when it comes to checking out. Plans can only be bought on twelve-month terms, but they can be canceled at any time with a one-month deadline at the end of the contract period. There is no setup fee. Customer service options are quite limited. You can email or phone the company from 08:00 to 16:30 on Monday through Friday. There is no help center and no knowledge base, therefore not really the option of supporting yourself outside of business hours. Needless to say, support would be improved by the introduction of live chat and longer business hours. Greatnet.de offers a no-frills website with fuss-free packages. If you’re looking for simple plans with no complex add-ons or customizations, from a host that owns its own German data center, then Greatnet.de could be a good fit for you. Wondering how Greatnet.de stacks up against other Web Hosting companies? Enter any other Web Hosting company and we will give you a side-by-side comparison.